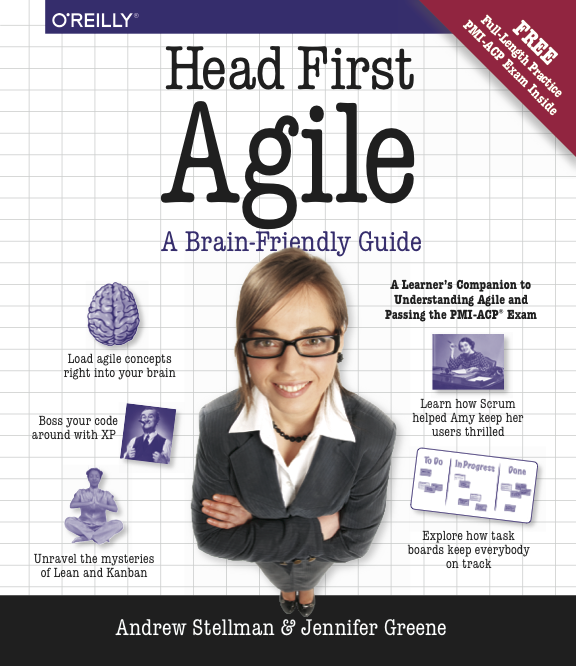 We are extremely excited to announce our next book, Head First Agile, will be published by O’Reilly Media. Have you been reading about agile, and want to learn more? Do you think that agile might help you and your team build better software? You’re not alone. Agile has gotten really popular with software teams because the ones that have “gone agile” often talk about the great results they get. The software they build is better, which makes a big difference to them and their users. Not only that, but when agile teams are effective, they have a much better time at work! Things are more relaxed, and the working environment is a lot more enjoyable. We have two goals for Head First Agile. First and foremost, we want you to learn agile. But we also are focused on our readers looking to pass the PMI-ACP certification, so not only does the book have 100% coverage of the material for the PMI-ACP exam, it also includes end-of-chapter exam questions, a complete exam study guide, exam tips, and a full-length practice PMI-ACP exam—everything that you need to pass the exam. Head First Agile will be available at retailers in Fall 2016.